A handsome large twin provn ram out of Ruby and Jasper. Moorit-grey with gorgeous fleece. He carries the solid gene. Very nice conformation, tall and long with a nice topline, good chest and rump. Nice wide horn set. Friendly and approachable, confident and calm. Good all around farm ram. Will make a nice addition if you're looking to bring in height, body length and/or moorit. Gave us many lovely lambs. 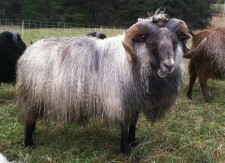 Mercury is handsome black-grey ram from Knoll Farm. His AI genetics include 1/4 Grimur, 1/8 Alfur, 1/16 Fengur. 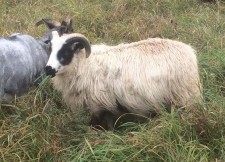 He is a sturdy, well-built ram out of a black-grey sire and a black badger-faced ewe. His overall conformation looks excellent with a broad chest, straight topline, great rump and fantastic horns. He has given us many beautiful lambs. His temperament is laid back and approachable. Some halter training. 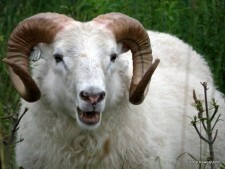 Ragnar is handsome well built white patterned ram from Knoll Farm. His AI genetics include 1/8 Mango, 1/8 Smyrill, 1/8 Bambi, 1/16 Peli. He is handsome with great looking conformation, tall and alert with a nice topline, good legs and chest, and a really nice wide horn set. He carries the moorit gene and spotting and gave us many beautiful lambs. Used one breeding season to bring in some additional new blood. 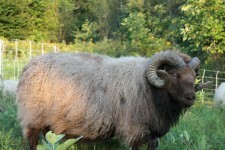 Elk is a large solid moorit proven ram out of Maple and Ursus. His AI genetics include 1/8 Bambi, 1/16 Kari, and 1/16 Rektor. Moonshine is solidly built black-grey ram used two season on our farm. He is a twin out of a black-grey dam and a white sire. He carries the spotting gene. He has a nice mix of AI lines which include: 1/8 Blettur, 1/8 Laekur from the sire and 1/32 Bambi, 1/64 Noi, Hunn, Morro, Moli, and Peli from the dam for a total of 35% AI genetics. He produced many beautiful lambs, with a 100% settling rate. 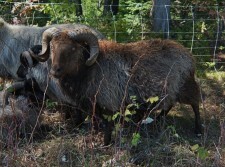 Ursus is proven solid moorit ram from excellent genetics. He is 1/4 Bambi, 1/8 Kari, 1/8 Rektor, 1/16 Serkur for a total of 9/16 AI genetics. He is sturdy, well-built ram out of a moorit badgerface sire and a moorit ewe. He carries the spotting gene. Sire and dam both have a beautiful fleece, and very nice conformation. He has excellent horn conformation. His fall 2010 lamb fleece won Best of Show award at the VT Sheep and Wool Festival. He had a 100% settling rate for 2011 & 2012 and threw many beautiful lambs. Ember is a proven ram out of a black badgerface sire and a white spotted ewe. 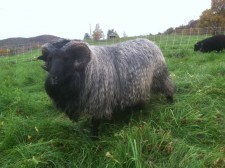 He is a black mouflon with gorgeous, glossy award-winning fleece. He is high energy, with a beautiful topline, very tall, with a solid chest and neck. He is just an all around fine animal and has given us 90% mouflon patterning presenting or know through breednig in his offspring. He also has thrown badgerface, black-gray, white & spotted lambs. He has a 100% settling rate. His genetics come from SRX, Frelsi & Kimball. One of our meatiest and most robust rams that we've used on the farm. He has beautiful conformation, lovely fleece, and a gentle disposition. He is solid black with white patterning (visually, of course, he is white) and has thrown black, white, badgerface, & spotted lambs. He could carry gray. He was sold to a farm in Alaska who air shipped him up there to bring in new blood to the Alaskan Icelandic gene pool. Sold 2010. A tall mellow spotted black badgerfaced yearling ram out of Ivy and the large and meaty Knoll Farm ram Lake. Good conformation with long body, nice chest and rump. Carries moorit from his dam. AI genetics from: Laekur, Blettur, and Kari. A classicly stocky ram out of Garbo and Dakota. Out of a very milky line. Very nice conformation with excellent topline, broad chest and good rump. His build is ideal for grass fed operations and many of his lambs show his shorter more muscular stature. Nice wide horn set. Confident, calm and friendly. AI genetics include 1/4 Raftur, 1/8 Grani, 1/8 Kani and 1/8 Flotti. A stocky young ram lamb out of Kind Horn Farm's AI ewe Gossi and the large and meaty AI ram Drifandi. Good conformation with muscular classically stocky build, ideal for grass fed operations. Confident, calm and friendly. Carries moorit and spotting. He is 85% AI genetics from: Drifandi, Dropi, Udi, Grimur, Flotti, Morro and Molur.